The long-awaited Rotterdam chess game was born in the year 2010. Designer Harry Hoek talks about how his creation came to life and his love for chess. Alright, so that explains his passion for the buildings of Rotterdam but, why a chess game? ‘I used to play a lot of chess as a young boy. Many of the designers I admire have created chess games.’ Alexander Calder is one of them. The only sculpture by this American artist in the Netherlands can be found in the Rotterdam Hoogvliet district: Le Tamanoir or Ant-eater, from 1963. Calder was a passionate chess player himself and wanted to be able to play whenever, wherever. He designed a handy travel chess game in 1942. Back to Hoek. He’d had the idea for a chess game made of typical Rotterdam buildings for a while but couldn’t find a suitable queen. Only with the arrival of the Erasmus Bridge in 1996 had he found her. 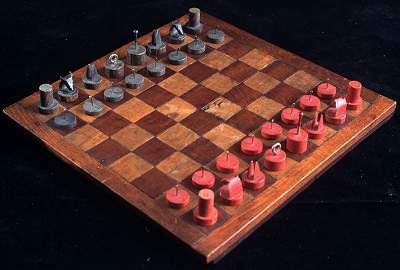 Hoek’s first version of the Rotterdam chess game was a non-abstract design, which proved too expensive to produce, but luckily the concept was saved and the Chessmen Museum has provided a home for this unique design. Before reaching its final destination, the chess game had been gathering dust for years until Harry, on one of his bike trips, saw the new Navigation and Transportation College. ‘The shape of that linear building looks so much like the knight of the chess game. I got my inspiration back and started looking for more abstract buildings that show similarities to chess pieces. 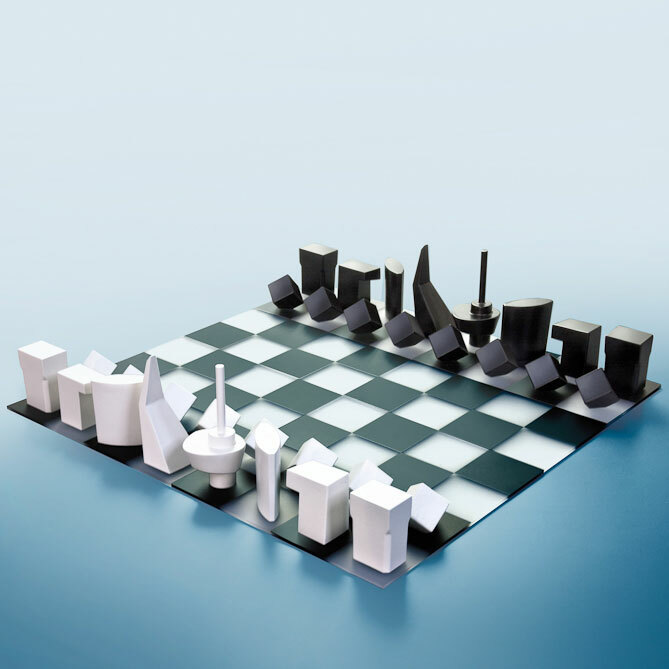 The World Trade Centre and the Maas Building, situated on the Boompjes Boulevard, fitted the frame.’ The Cubic Houses would be the perfect models for the pawns and just like that, the idea for an abstract chess set was born. Not only did Harry find it more attractive, it would also be easier to manufacture. And easier means cheaper, something that was much needed. Together with business partner Carel van der Poel, Hoek would go around companies and municipalities to raise funds for his chess game. Everybody loved the idea but Hoek and Van der Poel weren’t able to raise enough money. So in 2008 they presented their design, in Extra Large size to be played on the street, to RotterdamIdee. This community organization wants to make the dreams of Rotterdam residents come true. The Big Rotterdam Chess Game was one of the chosen ones and Harry and Carel were awarded 5000 Euro to start manufacturing their design. With some extra financial support from the Chessmen Museum, the Extra Large chess game became a reality. It was inaugurated during the Rotterdam Museum Night in 2010. ‘There are two Extra Large chess sets now, one at the Chessmen Museum and one at the Public Library, and every day people use them. We get very positive feedback on them,’ says Hoek proudly. The next step will be to place the Extra Large games at schools and hopefully also at Rotterdam-The Hague Airport.